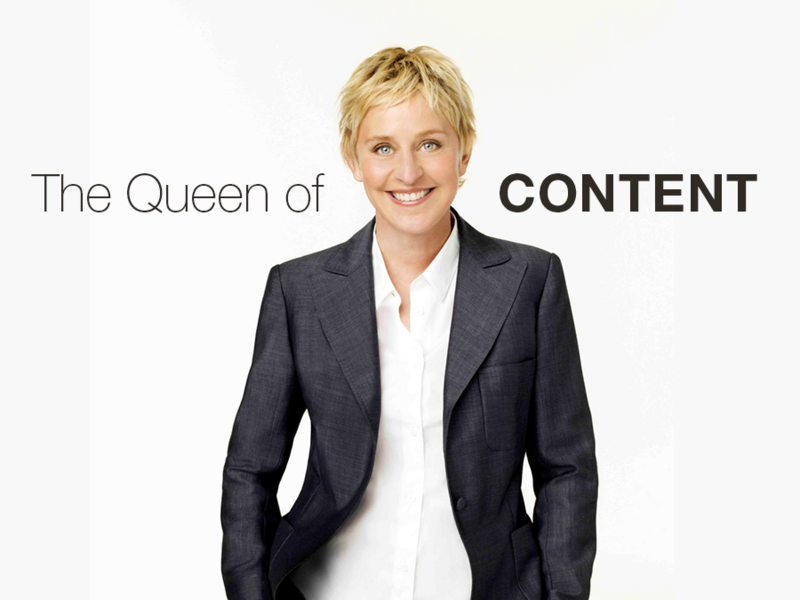 Just like we nominated Jimmy Fallon as the King of Content, we’re putting Ellen Degeneres up on the “content marketing pedestal” as our nominated Queen of Content. Ellen is a content-generating machine, and her team understands how to leverage social media well enough to get show clips going viral among her fans, content that includes the time when Ellen invited the Oscars pizza delivery guy to get his tip at her show, or when Julia Roberts talked about how she scares her kids. Ellen and her team also reach out to internet sensations, like the hilarious Southwest flight attendant and the cute cupcake kid, both of which turned out to be highly shared content this year alone! Speaking of highly shared content, we checked out the stories about Ellen and her show to see which caused spikes in sharing/clicking. 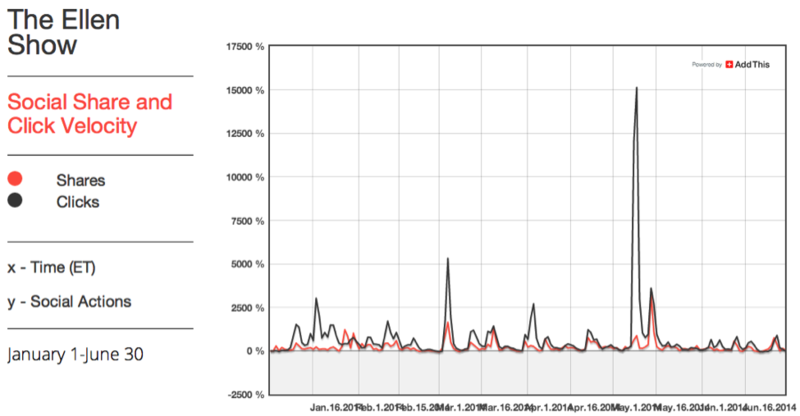 It turns out that Ellen, just like Jimmy, had key show airings that took off in online sharing. This year, Ellen’s March 3rd “Oscars Pizza Guy gets a tip” show had one of the top spikes, with an increase of 5,000% in social mentions. The May airing of Michael Jackson and Justin Timberlake’s music video also caused a social sharing wave. But Ellen’s top spike in both shares and clicks this year was when the adorable Taiwanese twins Zony and Yony came onto the show giving Ellen an incredible 15,000%+ increase in social mentions! Other content with top clicks this year include a story about a 13 year-old singing sensation, and a compilation of Ellen’s best scares. One of the most clicked posts was about Derrick, owner of a pizza place in Iowa, that shuts down his restaurant once a week to feed the homeless. Ellen and her audience were so touched by his story, they gave him a $10,000 check to help him out. 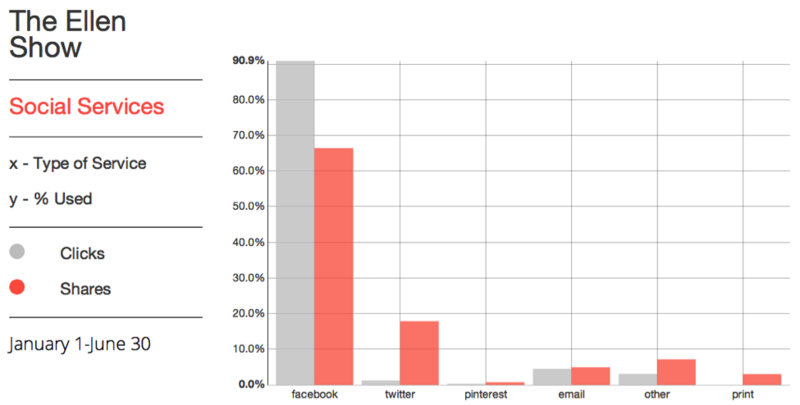 Facebook is the place to share Ellen’s content, with Twitter coming in second. Interestingly enough, 70% of content was shared on mobile while 30% was on desktop. Of the mobile shares, 60% was iOS and the other 40% was Android. Ellen and her team sure know how to create content that’ll get their audiences talking, and they do a great job providing the clips for their website visitors to share. In fact, you may have noticed their AddThis sharing buttons which give their page visitors an easy way to share content. From both Ellen and Jimmy, we know that fun, entertaining, even teary-eyed content is great for engaging visitors. But most importantly, the medium in which you provide content (e.g. video), and its accessibility are key to drive traffic. What other lessons did you learn from Ellen and Jimmy’s content strategy?